In another installment of the series called “In The Year 2010″ I will sit here and guess what will be going on by the end of 2010 with respect to various products. (Inspired by the Conan O’Brian skit “In The Year 2000″). This is a thought experiment, nothing more. There was the reach for yield. If one could get AAA C.D.O.’s for a higher yield than other AAA bonds, it was a no brainer. Both were AAA, obviously! No extra risk. A highly customized risk profile. If I looked at a pool and thought 6% of the balance was going to written off, but no more, I could buy the 7%-10% tranche and get a higher return. Obviously this higher return would need to match whatever threshhold I established, but that was most likely related to the market anyway. Some people referred to this as taking a position in the collateral with leverage. C.D.O.’s are, in essence, leverage on leverage, but this is a complicated, technical, and largely semantic argument. The surface intuition is that taking a levered position increases your return if nothing defaults, but less has to default for the buyer to lose money. C.D.O.’s were used to finance bonds or other debt positions. “How?” is what I heard you say, in the back? Well, think about it this way: an investment bank requires 50% of the purchase price of a set of bonds and charges LIBOR+100bps on the other 50%. We say that you’ve financed the purchase of the bonds two to one at a rate of one hundred basis points over LIBOR. Now, using our example, let’s say one could issue a C.D.O. and sell enough bonds to get 50% of the purchase price of the underlying bonds up front. Let’s also assume that the liabilities have a weighted average interest rate of LIBOR+10bps. Using the C.D.O. instead of a traditional loan, especially since the C.D.O. can’t be cancelled like a loan can and, most likely, contains much more lax terms than a loan, is much more cost effective. Taking this a step further, it was even possible for C.D.O.’s to be issued that allowed more bonds to be put into the C.D.O. or allow bonds that were sold to be replaced. This effecive made the C.D.O. a credit line with an extremely cheap interest rate. Keep in mind the “equity” or “most levered tranche” or “bottom” of the C.D.O. generally was structured to have a very high return, somewhere in the 15-25% range. Also, the backdrop of the boom in C.D.O.’s, don’t forget, was a very low rate environment. If one could get LIBOR+10-15bps on AAA bonds when rates were, in 2004 for example, 1% (for USD LIBOR and the Fed Funds), that was a major out performance for a AAA security (AAA, how much risk could there be?!). Now that the historical context is out of the way, it seems pretty clear that some of these reasons for isssuing C.D.O.’s will not diminish in importance. Funds and money managers will always need more yield. Investors that are smart about credit analysis will always want to take the risks they understand and get paid for taking said risks. Funds and other “levered players” will always need financing. So, let’s examine how the landscape changes rather than disappears. Complexity will die. There are a number of reasons for this. Part of the reason is that buyers of C.D.O.’s will begin to realize that structure adds a layer of complexity that no one really can grasp fully. Why have dozens of triggers and tests at every stage of the waterfall (the way cash is distributed in order of seniority)? In some deals, I’m sure, this complexity helped some tranches of the C.D.O. In some other deals, I’m sure, this complexity hurt some tranches of the C.D.O. The one constant is that it’s nearly impossible to tell the right levels and specific mechanics beforehand. Hence the complexity will die and structures will simplify. Likely this also means less tranches. Why have a $4 million tranche size in a $400+ million deal when you can’t even predict losses within an order of magnitude (1%, 9%. or 20%? Who knows?!)? This is hardly a new concept, I introduced it already when discussing residential mortgages. Arbitrage C.D.O.’s will reign supreme. This one is controversial, and the term “Arbitrage C.D.O.” almost takes on a different meaning each time it’s defined. The intuition, though, is that a hedge fund taking advantage of a market dislocation by issuing a C.D.O. is an “Arbitrage C.D.O.” Why will these be popular? Well, C.D.O. shops, or firms that are serial issuers of C.D.O.’s, have mostly blown up and are done. Traditional money managers will be shying away from C.D.O.’s for a long time. So, in order to sell the C.D.O. equity, the most levered risky piece, the firm issuing the C.D.O. will need to also be willing to take on the equity–this leaves only hedge funds. Arbitrage C.D.O.’s also come together more quickly and generally are backed by corporate bonds. Funds and other accounts that, as a core competency, already analyze corporate credit won’t have to go “outside the comfort zone” to buy into arbitrage C.D.O.’s. C.D.O.’s or C.D.O. technology will become part of the M&A world more and more. Aha! Maybe too clever for my own good, but while all these specialty finance companies used to be able to issue a C.D.O. for funding purposes on their own, now they will need an investment bank to connect them with hedge funds or take on the debt, and thus the risk, themselves. These C.D.O.’s will likely be simple too (see #1), but will be an efficient way for these companies to finance assets or move them off the balance sheet. Here’s an example: a diversified finance firm, with a large lending presence, for example (most likely with a R.E.I.T. subsidiary, a popular structure of the past eight years) will be looking to sell itself. However, because the assets on it’s balance sheet look risky the leveraged finance groups will need to arrange some financing against those assets. The structure? Most likely a C.D.O. with hedge funds providing the cash and getting a “juiced” return on their money. This is essentially the covered bond product, but with an extra layer of complexity (tranching) on top. Okay… that’s enough prognosticating for now. Still deciding which product is next. Drop me a line if you have a favorite! No one, inside or outside the company, could accurately predict what … ultimate losses would be. But what they could do—and what financial services investors can do now, regarding the banks in general–is make reasonable estimates of ranges of losses, and estimate companies’ future earnings power, then compare that to their market values. I emailed Tom to clarify a few thing, but never heard back. So, as I am prone to do, I’ll assume I’m correct in my interpretation and move on. I’m assuming that this was also the case in the past–how else would people be able to buy into a financial institution in the past if Tom didn’t think his words were just as true two to three years ago? (Nothing has really changed in disclosure requirements, right?) Surely, in the past, the issue would have been taking a view on the performance of the various financial institutions’ assets as well. I looked at three firms’ disclosure, from 2006, related to C.D.O.’s … what I could find. Now, in the interest of full disclosure, I’m not trained to do this. I’m just a person, with some financial experience, looking at some S.E.C. filings. I knew i was looking for C.D.O. exposure, especially in the context of figuring out what banks would need to be responsible for if the market had a severe dislocation. Let me explain what I mean by this. Remember all the liquidity put chatter? While mostly related to S.I.V.’s, this is still a relevant concept for C.D.O.’s. As in any syndicated deal, most common for selling bond or stock offerings related to corporations but also relevant for securitized products, when an investment bank agrees to do a securitization they have most likely (call it 80+% of the time) agreed to “take down” or purchase the securities they are unable to sell to investors. Easy enough, right? Those assets are what has generated a huge amount of writedowns. It’s very easy to see the relationship between market share in the C.D.O. and securitized products space and magnitude of writedowns. These relationships, however, are very complex. Multiple investment banks could be selling an individual deal and each could be responsible for purchasing different parts or different percentages of leftover securitizations. These are individually negotiated for each transaction. As a firm is building up assets (for example, sub-prime mortgage-backed securities), before they have enough to actually securitize and create a C.D.O., the bank/investment bank could have all the risk of those assets losing value or defaulting–if the C.D.O. doesn’t get done then it becomes a big problem. It’s also a big difference what types of assets or structures make up the C.D.O. securities. One sees the problem growing. There is a lot of information that needs to be processed to come up with a reasonable estimation of losses. I would claim that it is completely insufficient for a bank, as they have been, to disclose exposures once they start to become a problem. So, what did I find? Terrible disclosure. I was able to find almost no information. Certainly no information that would have helped come up with an estimate for losses from these firms based in any sort of logic or fact. Now, I’m not saying one should be suspect of current disclosure–I don’t know what is next to blow up or cause big problems and none of these firms are run by the same regime that decided the previous level of disclosure. What I am saying is that I wouldn’t have been able, even if I had known exactly what was going to happen, to know the magnitude of the losses. First, I looked at Citi. Citi had a notion of participating or structuring. Those numbers were combined and reported together. This helps to determine market share, perhaps. This does nothing to disclose the risk on the balance sheet. This number ($110 billion) could be made up entirely of bonds were Citi is at risk. It could also be entirely made up of bonds where Citi has no risk and is taking fees. There is nothing I found in the 10-K’s to say anything more helpful. So we know losses, if these C.D.O.’s (named V.I.E. 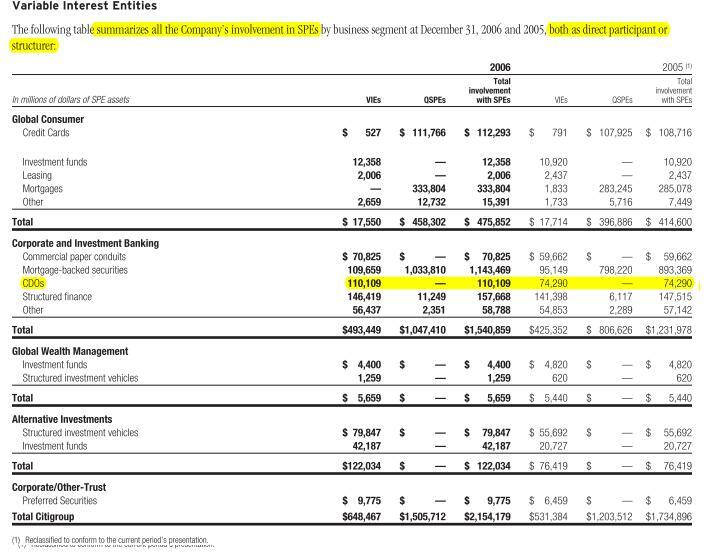 or Variable Interest Entities in the disclosure) were sold at 22 cents on the dollar, as Merrill reportedly did, the losses would have been between zero and $86 billion. Whew! Nailed it down… Now, knowing that, do you buy or sell Citi’s stock? Second, I looked at Merrill. They state some numbers and then footnote saying they might, potentially, hold a financial interest in some of the securitizations. Same situation as Citi. No disclosure as to what kinds of bonds these are. How much was retained? How much in financing obligations exist related to these? What percentage would have had to be retained by Merrill if unsold? Last I looked at Bear’s filing. Bear was a slight improvement. They actually stated some of what they retained and have some exposure numbers which one could back out some other information from. Still, if I was modeling the losses I would be asking for a lot more information–while an improvement, in my opinion, it wasn’t enough. Below are the tables from the various filings. Also, if one was looking for C.D.O.’s, I put the number of instances the term of interest appeared. Now, since the S.E.C. is mandating and revamping filings and disclosure, perhaps they can do something about this. Maybe financial firms should be forced to disclose risk numbers and sensitivities. I certainly don’t have all the answers, but I think it’s pretty clear that no one had the answers, nor did they have the specific questions, before this crisis occurred.